Maine’s education data say schools hired 18,000 in 2015. They didn’t. Since ending a data management contract, the Maine Department of Education has taken on direct management of a system built for it in 2011, encountering some challenges along the way. As educators are increasingly asked to use data to adjust their teaching, the Maine Department of Education faces a number of challenges recording and presenting accurate information about Maine’s schools to the public. A third-party vendor set up the department’s “Data Warehouse” in 2011, but the department ended that contract during the 2015-16 school year, according to Lance Gilman, manager of the warehouse. Now between contracts, “We’re kind of in a limbo state with our data,” he said. The department’s cancellation of its software contract with Choice Solutions Inc. stemmed from Houghton Mifflin’s acquisition of the company in late 2013, Gilman said. “They were going in a different direction,” he said, and the department took over management of the data warehouse itself. Earlier this fall, the department began the process of hiring a new vendor to set up a system for collecting and publishing its data on Maine schools. It hopes to launch the new system in 2019. In the meantime, the department’s direct management has meant some delays and inaccuracies in parts of the state’s data system, which the department said it is working to address. The data system includes a wide range of school statistics, from enrollment to student discipline trends and financial information. 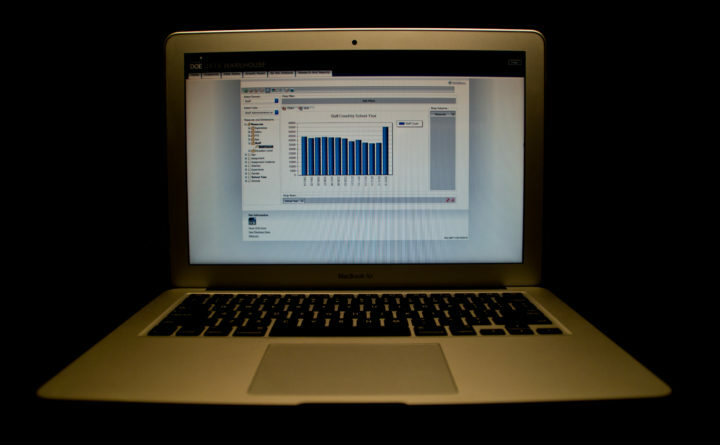 Over several weeks, the Bangor Daily News collected and analyzed education data available through the Maine Department of Education’s Data Warehouse, putting multiple years of information into a single dataset with school-level statistics. The review uncovered challenges with the current system and data quality issues in the 2015-16 school year that the department has begun to investigate. For example, the Data Warehouse information says the 2015-16 count of school staff and administrators jumped a whopping 50 percent from the previous year, to 54,660 from 36,473, after steady declines in prior years. That increase in staffing did not happen. If it had, that alone would have been enough to push Maine’s unemployment rate from 5.4 percent in September 2014 to 1.4 percent in 2015. Gilman said the department is investigating the data problem that appears to affect totals for individual schools, as well. For example, the data show staffing at Penquis Valley High School nearly quadrupling, to 214 from 58, in one year. Data on teacher salaries also revealed apparent aberrations, which Gilman suspected were due to changes made in 2015 to the rules governing how the department’s system collects and stores data. The situation has also led to some fragmentation in the data system. For instance, the department has published enrollment figures on its website for 2016-17, but those figures do not appear in the Data Warehouse. The department spent about $1.5 million on its contract with Choice Solutions Inc. from 2012 through 2016, according to the state’s Open Checkbook website, mostly using federal stimulus funds to pay the consulting and maintenance fees. It spent about $341,000 with Choice from the state’s general fund during that time. Gilman said the enrollment data and district-level financial information are both reliable, but the fragmentation of reports has led to some confusion for users, based on what he said is an increased volume of data requests. The department hopes to issue its request for data system proposals early next year, seeking a system that would help address data quality, collection and access problems.